So, you’re serious about learning to make perfect macarons? Then the following 8 tools will help you get there. French macarons are temperamental, but they’re definitely possible to perfect, even for us, home bakers. The proof is in the comments under my Lemon Macarons recipe. It’s the second most popular recipe on my entire blog (and if you’re curious, this one is #1). I’ve been making these delicious french treats for over 3 years now. And I’ve tried many different tools, ovens, and techniques along the way. (PS: Making macarons in a kitchen other than yours is not fun!) 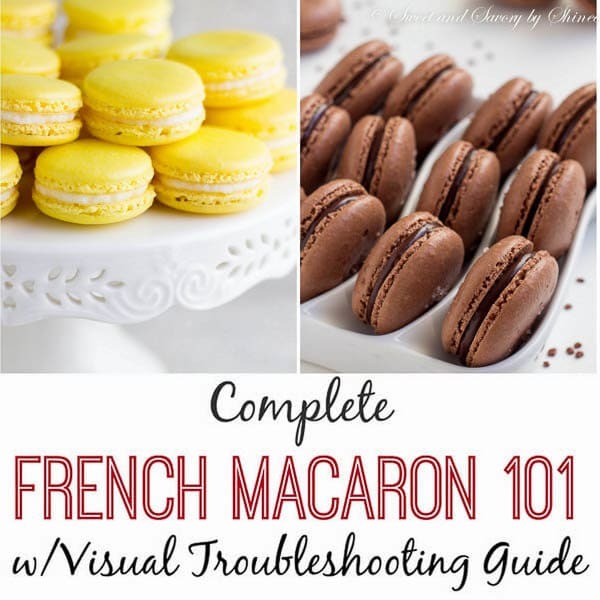 I’ve already shared my tried and true macaron recipes, a comprehensive French Macaron 101 with lots of tips and tricks and visual troubleshooting guide, and even detailed video tutorial. And now it’s high time to show you what kitchen tools are essential in making macarons and why. French macarons require precision!! I weigh not only the dry ingredients, but also egg whites (<- because I use farm fresh eggs and they vary in size). I learned the hard way that too much egg whites add excess moisture to the batter, causing all sorts of problems. That’s why getting a scale is essential if you’re serious about learning to make macarons, or any baking for that matter. Sifting the dry ingredients is another important step. By doing so, you’ll get rid of big chunks of almonds, thoroughly mix the dry ingredients and aerate the mixture. In my macaron recipe, we sift the dry ingredients 3 times! Crucial for flawless macarons. 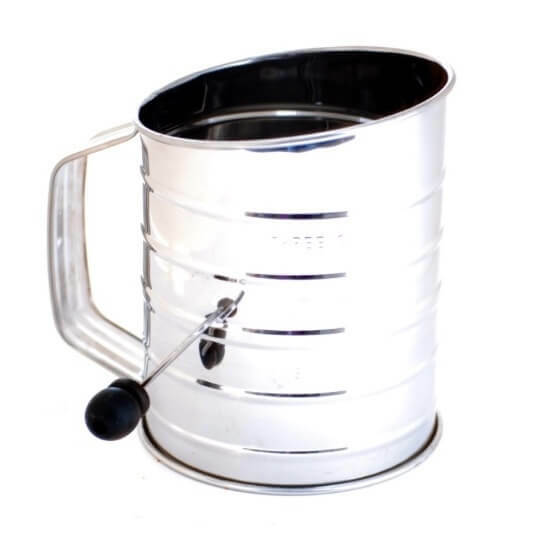 I use this and this for sifting. You probably have one or another, but either one works just as great. Again, you’ll use this not just for making macarons, it’s also useful in baking extra-fluffy cakes. Did you know that not all ovens heat properly? The temperature could vary 25-50°F up and down. What? Yes, it’s true! For example, when you set your oven to 350°F, it could heat to up 400°F!! That could easily burn your cookies and cause many other issues, like too much browning, cracked top, etc. My mom’s oven is even crazier, it keeps getting hotter and hotter. Don’t even think about baking something for over 30 minutes in it! So, the solution is to get an oven thermometer to accurately set the oven temperature. This inexpensive little tool might just save you whole lot of headache! Unless you want to spend 30+ minutes to whip egg whites manually, you need some electric help in a form of handheld mixer. To be completely honest, I mostly use my stand mixer, only because it’s right there on the counter. 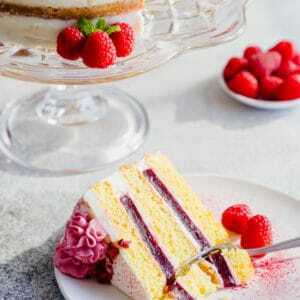 Simple hand mixer will do the job just fine! No, not necessarily these glass bowls, and you don’t actually have to go out and buy new bowls to make macarons. 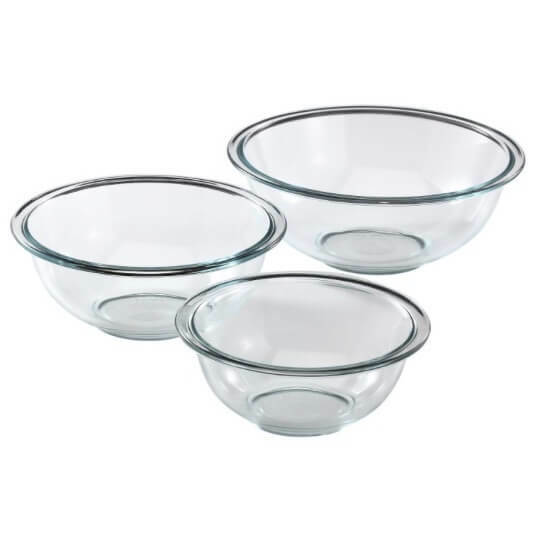 What I’m trying to say is don’t use plastic bowls, because plastic bowls tend to absorb oil, which is the biggest enemy for good stable meringue. So get your stainless steel or glass bowls out and start whipping those egg whites. Macaronage, aka folding technique, is a skill that you’ll need to master. And having comfortable n’ flexible silicone spatula makes the job so much easier. 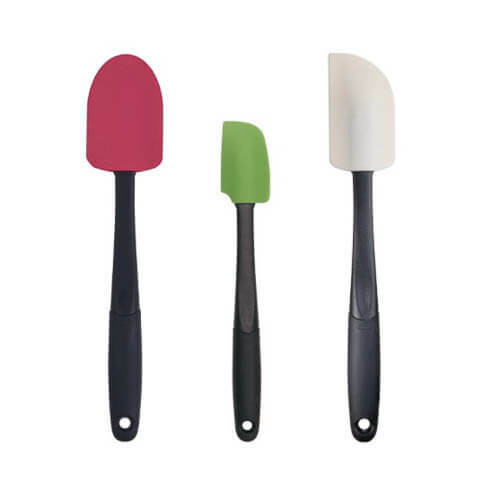 I love this OXO spatula set, the far right (white) one is what I use for folding. Again, these are must-haves for any kitchen. I can’t imagine cooking and baking without them! I get asked a lot how I make perfectly round, uniform macarons. The truth is they’re not always perfectly uniform, but practice makes everything better. I don’t use stencils or anything, I pipe the macarons free hand. What helps me is a regular piping bag with large plain round tip. 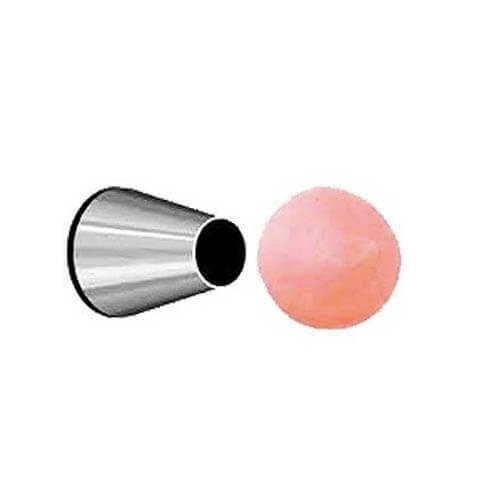 I use this Wilton A1 tip. And you can watch me in action in my video (piping starts at 3:20). Last, but not least, nice and think baking sheet helps to cook the shells evenly. 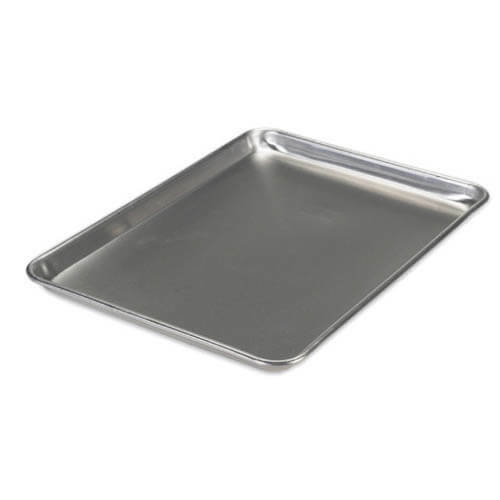 I’ve been using this heavy-duty aluminum baking sheet for quite a while, and it’s my absolute favorite. I have about 5 of them, and use them for everything! And there you have it. I can’t promise you’ll have perfect macarons after you get all these tools, because you know, sometimes macarons fail for no apparent reason. But I can assure you, you’ll have much higher success rate equipped with these tools and my tips and tricks I’ve shared here. 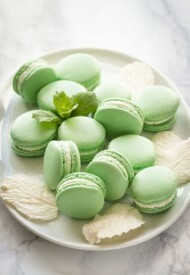 And if you try any of my macaron recipes, don’t forget to share your experience with me. I love hearing from you. This post is not sponsored, but does contain affiliate links to products I use and love! Read the full disclosure here. 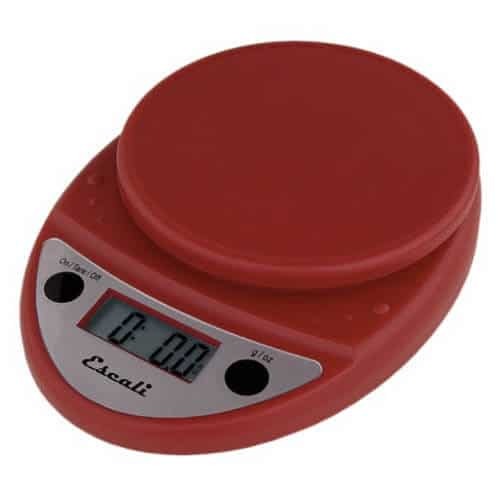 Going to try making Macarons for the first time and taking your advice about using a kitchen scale. If I’m using a scale without a bowl how do you account for the weight of a bowl or measuring cup? Hi, Denise. When you place an empty bowl on your scale, hit a button that says “tare”, which brings the scale to 0. Then you can add your ingredients. I made my first batch last night. And it was not perfect but was excited that its the first time Im trying it. Problem I faced was hollow shells. I used parchment paper and a dark cookie pan. Does that effect the result? Does the cookie need a thick pan or double pan ? ( since I have seen some youtubers place two cookie sheets together). Im just wondering. Waiting ur response. Hi, Nisha. I do recommend using thick baking sheets. I use aluminum baker’s half sheet with parchment paper. If you have thin cookie sheets, so yes, I’d recommend on doubling it. But it’s best if you get one thick baking sheet. As for your hollow issue, there’re 2 main reasons that could be causing it. 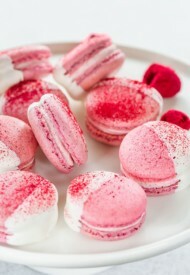 1. over-beated meringue and 2. under-baked macaron shells. Hope this helps, you can also read this troubleshooting guide for more tips. I’m gonna try to make macarons soon for the first time!!!! 🙂 But I do not have a electic hand mixer. 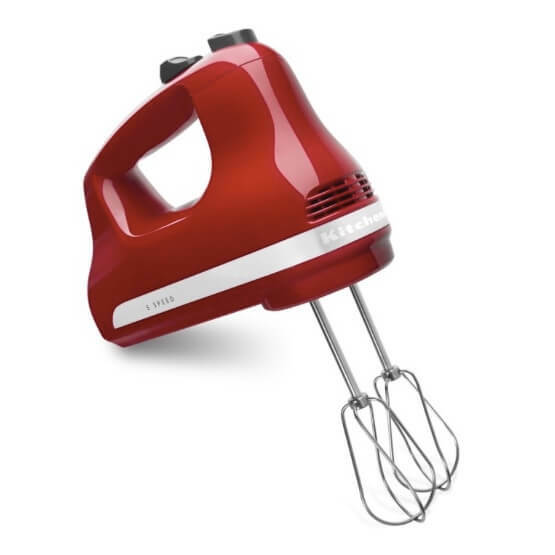 Would a electric stand mixer work? Hi, Ally. Stand mixer will work perfect. That’s what I use. Good luck!! 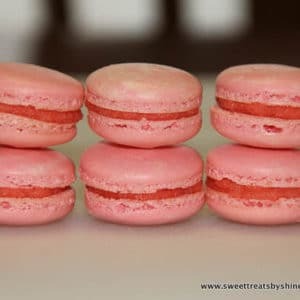 I’ve tried a few different macaron recipes with successes and failures. I’ve realized, though, that I’ve failed every time I used the french meringue method and my italian meringue macarons came out perfect every single time. I’d love to have the same kind of results with the french meringue, but so far it’s not happening. I’m not sure where I’ve gone wrong. Hi, Donna. 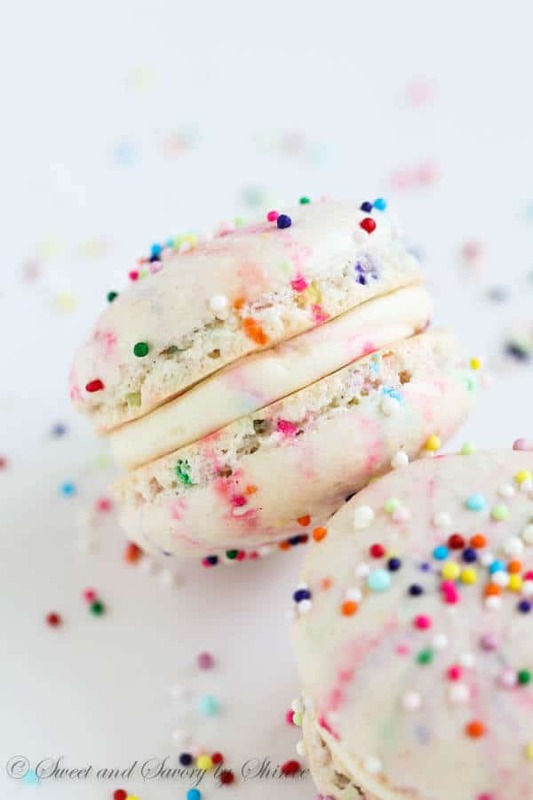 What are the issues you’re having with french meringue macarons? Are they the same issues, like no feet, cracks, etc? Or is it every time different thing? The quality of meringue directly affects the final macarons. And since Italian meringue is much more stable, the final results tend to be more consistent. If you can share the most common issues you’re having with french meringue macarons, we may be able to find the culprit. Also I’d recommend checking my French Macaron 101 post, which may also help with some of the questions. Well, I’ll give one example. A few days ago I tried the french method – piped the batter onto two pans. When the first set formed a skin I went ahead and baked them off (they were on a silicone mat) at 300 deg. F for 15 minutes in a conventional oven. When they were done I put the second batch in – didn’t do anything different from the first batch, except that these were on parchment paper. The first set had formed nice looking feet, but they were sticking to the mat. When the second set was done (baked for the same 15 minutes), they were all cracked on top, didn’t form feet and were hollow. The bottom of these shells, however, didn’t stick to the parchment and were nice and smooth. I was baffled because it was the same batter, and they rested long enough to form a skin. The second batch actually rested 15 minutes longer than the first. I put the first set back in for 2 minutes, and they were tough on the inside instead of soft and chewy. Yeah, these weirdest issues are so annoying. I’ve been there. Same batch, completely different outcomes. Baffles me! But here’re a few of my notes: 1. I don’t really like silicone mat for macaron baking (everything else – love it, but not for macs!). They’re thick and don’t transfer the heat right. Hence your macarons are sticking, they’re probably slightly underbaked. 2. As for the second tray, I’d be curious to see a photo of those. But is it possible the oven is heated over 300°F? 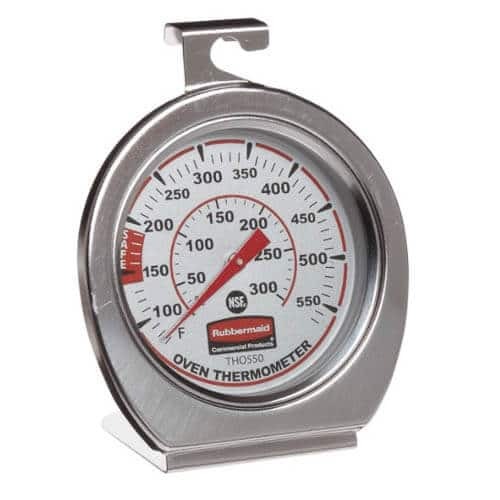 Do you have an oven thermometer to double check? I’m thinking maybe when you put that 2nd tray, oven was heated a bit higher (some ovens tend to continue to heat even though it’s set to 300°F) causing the shells to rise quickly then collapse and crack? Hi, Abbey. Honestly I’m not sure how different stainless steel from aluminum baking sheets. As for silpat, I’m not a huge fan. The feed tend to bulge with silpats, and I feel like it doesn’t heat evenly. I prefer parchment paper. Hi, Coreen. 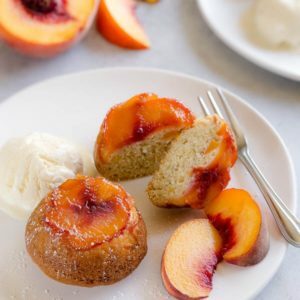 What recipe did you try? It sounds like multiple reason could be causing your issue. 1. 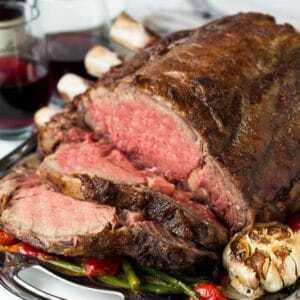 Do you have an oven thermometer? Sounds like your oven runs a bit hotter. I’d check and make sure your oven temperature is accurate. 2. The hollow shells are usually caused by over-beaten meringue. So watch carefully when you whip the egg whites. You want to stop beating as soon as egg whites reach hard peaks. 3. Also, why you dry your macarons that long? Is it pretty humid where you live? If you over-dry your macarons, it can also cause the bulging feet. 4. My macarons don’t stick to the parchment paper, they just easily slide off. But I had read a tip in Laduree book that if you pour a teeny-tiny bit of water UNDER the parchment paper when you bring out the macarons from oven, it’ll help loosen the macarons from the paper. Macarons are some of my favorite treats. I had no clue that making macarons was this involved! I’ll probably stick to buying them from my local bakery when a craving hits! I am so frustred and upset right now! 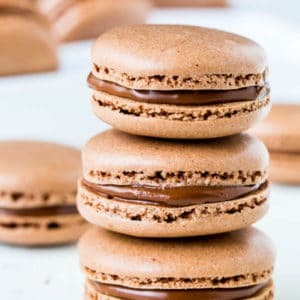 I’ve tried many recipes of how to make macaroons and I can’t get it done right ! Hi, Dalva! Sorry you’re having a rough time with macs. I can totally relate and understand your frustration. Would you mind sharing what are the problems you’re having? I can try to help you with troubleshooting. 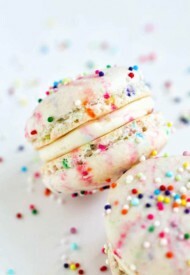 Also you may find this post helpful too: Macaron 101. Macarons are so temperamental, huh? 🙂 Glad you found this post helpful, Karen. Thanks for stopping by. I have never made a macaron before but I’m dying to. So glad to have these perfect tools and tips – can’t wait!!! Allie, it’s time to try your hands at macarons. You’ll do great!